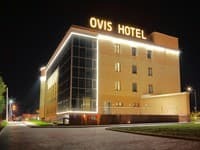 "Iris art Hotel" is located near the city center. The hotel has 30 spacious and elegant rooms that meet all the requirements of travelers and business people. In all rooms - eco-friendly furniture, windows with black-out blackout system, climate control system. 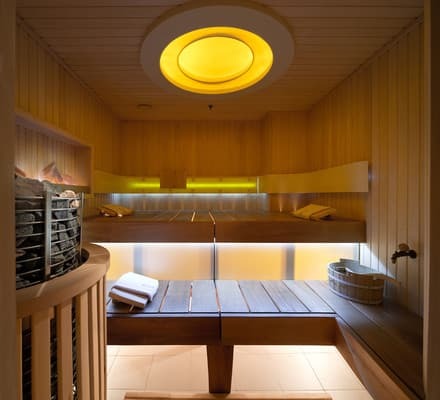 In "Iris art Hotel" there is a modern sauna with a niche of Himalayan salt, free Wi-Fi, parking. 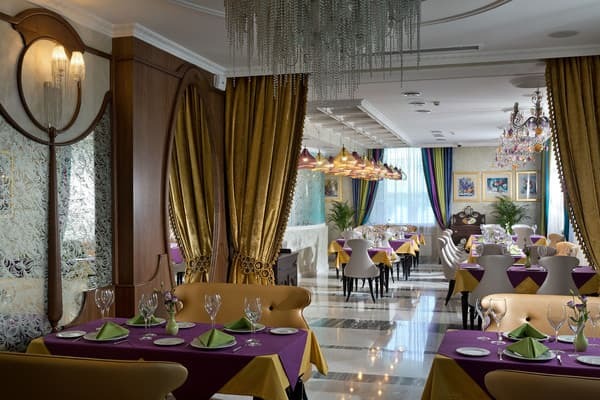 The restaurant "Iris", located on the 1st floor of the hotel, offers a wide choice of European and author's dishes. Also on the ground floor there is a lobby bar around the clock. 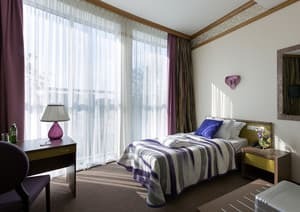 The tranquility of the streets, the proximity to the center and the possibility to get to any part of the city make Iris art Hotel an ideal place to stay, and the view of the green park and the pride of the city - the Metalist stadium, opening from the panoramic windows of the rooms, will not leave you indifferent. The distance to the city center is 4 km, the railway station - 5.8 km, the bus station - 7.2 km, the airport - 9.8 km, to the Metallist Stadium - 1.3 km. Description of the room: Placement in the hall: theater, class, negotiations. Description of the room: The room of this category has a separate and extraordinary design. This number is suitable for those who are not used to limiting themselves to the standard framework. Area of ​​the room is 18 square meters. 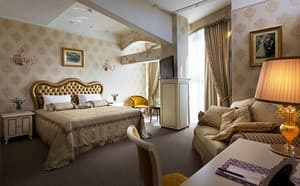 The room is equipped with a bed with orthopedic mattress, bedside table, modern climate control system, as well as a set of mini perfumes. Description of the room: The room is ideal for an individual tourist. This is a versatile room with panoramic windows. Some rooms have a balcony. The room has a bed with an orthopedic mattress, a bedside table, and a set of mini perfumes. 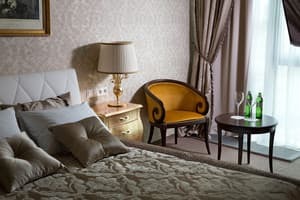 Description of the room: Spacious and at the same time cozy room up to 25 square meters, the windows of which overlook the beautiful city park or on Moskovsky Prospekt. 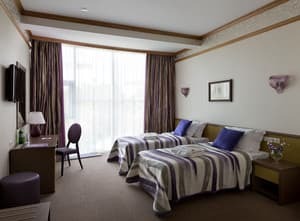 The room has a wardrobe, 2 single beds with orthopedic mattresses, a working area, two bedside tables, a modern climate control system, and a set of mini perfumes. Possible single occupancy, specify at the time of booking. Description of the room: The room is elegantly zoned and decorated with hand-painted, which creates an atmosphere of solitude and romance. 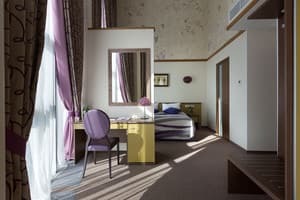 The room has a wardrobe, a large bed (160 * 200) with an orthopedic mattress, a work area, two bedside tables, a modern climate control system, and a set of mini perfumes. Description of the room: The room is exquisitely furnished and decorated with hand-painted, which creates an atmosphere of seclusion and romance, perfect for honeymooners. 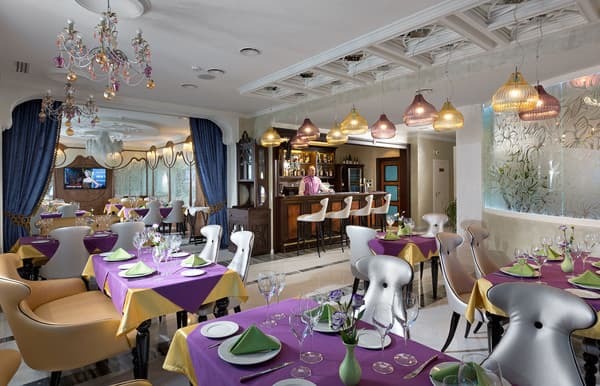 The interior, made in light colors, gives the room a special festivity and lightness. Panoramic windows, work area, luxurious furniture for relaxation, large bed (180 * 200) with orthopedic mattress. The room has a modern climate control system. The bathroom is equipped with a make-up mirror, as well as an expanded set of mini perfumes. The room area is 33 sq.m. 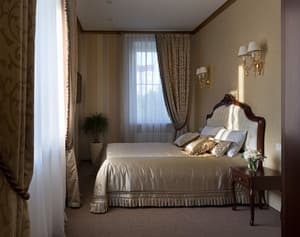 Description of the room: The room consists of 2 rooms: a living room with a working area and a place for rest, as well as a bedroom with a luxurious double bed (160 * 200) with an orthopedic mattress and bedside tables in the color of gold. And in order to be able to comfortably enjoy the view of the city from the panoramic windows, there is a small area with a coffee table and a comfortable armchair. The room has a modern climate control system, a bathroom equipped with a mirror for make-up, as well as an expanded set of mini perfumes. The 33-square-meter room is ideal for travelers, for whom comfort and personal space are as important as the opportunity to work fruitfully. 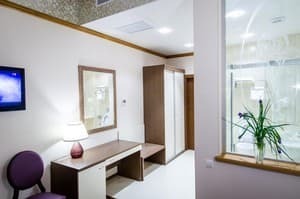 Description of the room: The room consists of 2 rooms: a living room with a working area and a place for rest, as well as a bedroom with luxurious furniture made of natural wood and a large double bed (160 * 200) with an orthopedic mattress. 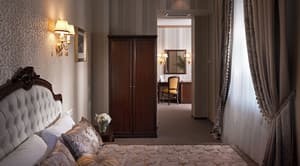 The room has a modern climate control system, a bathroom equipped with a make-up mirror, as well as an expanded set of mini perfumes. And going out onto the balcony, you can enjoy a cup of invigorating and fragrant coffee. The 40 m2 room is ideal for a relaxed stay. 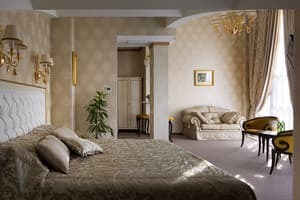 Description of the room: The room consists of 2 rooms: a spacious living room with panoramic windows, a working area and a place for rest, as well as a bedroom with luxurious furniture made of natural wood and a large double bed (160 * 200) with an orthopedic mattress. 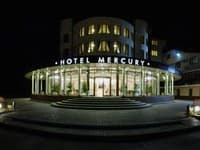 The room has a modern climate control system, a bathroom equipped with a make-up mirror, a full set of terry products, as well as an expanded set of mini perfumes. And going out on the balcony, you can enjoy a cup of invigorating and fragrant coffee. Room area of ​​41 square meters is ideal for travelers, for whom comfort and personal space are as important as the opportunity to work fruitfully. Description of the room: The best hotel room, with the highest level of comfort. Luxury, palace aesthetics and sublime beauty. The interior of this room allows you to emphasize the wealth and status of the guest. Thanks to the design, which combines expensive fabrics, natural wood and stone, a unique atmosphere of the room is created. Panoramic windows, chic furniture for relaxation, bar counter, large bed (180 * 200) with orthopedic mattress. The room has a modern climate control system. The bathroom is equipped with a make-up mirror, as well as an expanded set of mini perfumes. The room area is 46 sq.m. Всё очень понравилось: чисто, уютно, приветливый персонал. Accommodation of children under 5 years old - free of charge, from 5 to 12 years old - 50 UAH, additional place for adults - 100 UAH. 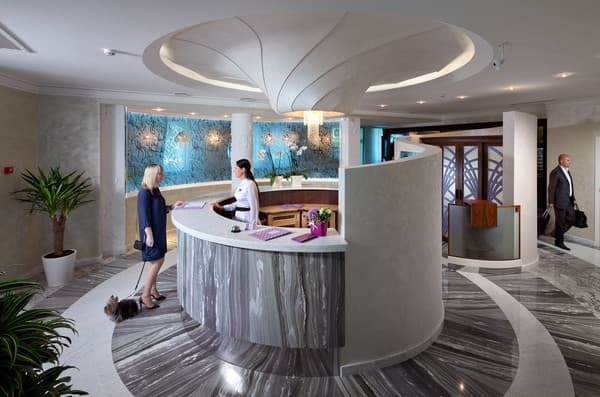 Iris Art Hotel provides room service. Restaurant and lobby bar work around the clock. Not far from the city center (4 km). The metro station Ploshchad Vosstaniya is 200 m. The distance to the railway station is 5.8 km, the bus station is 7.2 km, the airport 9.8 km, to the Metallist Stadium - 1.3 km. Directions from the railway station - shuttle bus number 11, tram number 6. It is possible to book a transfer from the railway station (70-90 UAH), from the airport (100-140 UAH).